Two Homes over 14 million Sold by Carvill SIR Recognized as Top 11 Transactions so far in 2018. Hawaii’s residential real estate market is having a banner year for sales of homes for $10 million or more, with 11 transactions closing for $15 million or more, and three of those selling for $20 million or more. The largest sale so far in 2018 was the sale of a five-bedroom house at the Kukio Golf and Beach Club on the Big Island that closed for $27.5 million in March. It was the highest-priced home ever sold in Kukio and possibly the second-highest price ever on the Big Island, Jim Schneider, principal broker of Kukio Properties, previously told Pacific Business News. The second- and third-highest prices in 2018 were on Maui. In February, a five-bedroom, seven-bath new beachfront home on Keawakapu Beach in Kihei sold in early February for $22.8 million, the fourth-highest sale ever on Maui. Dennis Rush of Elite Pacific Properties represented the seller, while Dave Richardson of Hawaii Life Real Estate Brokers represented the buyer. Earlier this month, another estate, a 13,422-square-foot home on a 0.52-acre lot on Keawakapu Beach closed for $20 million. Josh Jerman and Richardson of Hawaii Life Real Estate Brokers represented the seller, while Riette Jenkins of Elite Pacific Properties represented the buyer. The fourth-highest residential sale was Oahu’s largest transaction so far in 2018, the sale of a beachfront estate in Kailua for $18.8 million. The 8,348-square-foot estate was designed by architect Peter Vincent in an Indo-modern design and features multiple buildings on a 36,995-square foot lot that runs from South Kalaheo avenue to Kailua. Anne Oliver, vice president of Coldwell Banker Pacific Properties, represented the seller, while Paul Chu and Stephen Cipres of Elite Pacific Properties represented the buyer. No. 5 was back on the Big Island, a six-bedroom estate at Kukio that sold for $18.5 million in a transaction that closed in July. The 8,232-square-foot home on 2.27 acres in the Kaupulehu section, an oceanfront area north of the Four Seasons Resort Hualalai was designed by architect Bing Hu of H&S International and built by GM Construction in 2015. Schneider of Kukio Properties represented both the buyer and the seller. The sixth-largest residential sale so far in 2018 was in the Black Point neighborhood of Honolulu, between Diamond Head and Kahala. A five-bedroom, 7.5 bath oceanfront home called Punahele on Royal Place sold for $17 million in May. Beth Chang and Tracy Allen of Coldwell Banker Pacific Properties’ Honolulu office, and Anne Hogan Perry of the firm’s Kahala office represented the seller. Maria Yamamoto of HI Success Estate LLC represented the buyer. The seventh-largest sale was a Kahala Avenue home formerly owned by Genshiro Kawamoto that sold in January for $16.25 million. The seller, Alexander & Baldwin, had the home deconstructed and torn down for the buyer. Erik Hinshaw of Hawaii Life Real Estate Brokers represented the seller, A&B, in the transaction. The eighth-largest transaction was on Kailua Beach, and closed in September for $15.65 million. The property, which consisted of three parcels running from Kalaheo Avenue to the beach, had been listed for $18.9 million and had been in escrow from Feb. 28 until late September. Jonah Kogen of Hillside Realty & Development represented the seller, while Scott Carvill of Carvill Sotheby’s International Realty represented the buyer. The ninth-largest sale was on Diamond Head Road, a five-bedroom, 5.1 bath oceanfront home that sold for $15.15 million in March. Anne Hogan Perry of Coldwell Banker Pacific Properties represented the seller. Tod Tsukano of Pacific Management Group represented the buyer. 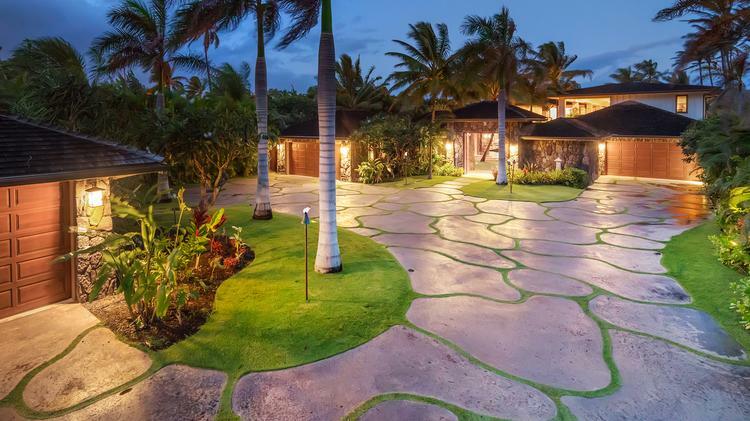 Tied for the 10th-largest sale were two homes that sold for $15 million each, one on Kauai and one on Oahu. The Kauai sale on Weke Road closed in March and was one of six homes on the beachfront road to sell in the first quarter, before heavy rains in April caused damage to the Hanalei community. The Oahu transaction was for an 8,187-square-foot compound designed by Peter Vincent Architects on Kaapuni Drive in Kailua. Real estate investor Marc Paskin, who’s also known as “Uncle Kokua” from a reality show on KFVE by the same name was the seller, and was represented by Patricia Choi of the The Choi Group with Hawaii. Scott Carvill of Carvill Sotheby’s International Realty represented the buyer. A beachfront estate in Kailua that was on the market for nearly five years and was the subject of a foreclosure lawsuit has sold for $15.65 million. The sale of 210 N. Kalaheo Ave., which was listed for $18.9 million and had been in escrow since Feb. 28, closed on Thursday. Jonah Kogen of Hillside Realty & Development represented the seller, while Scott Carvill of Carvill Sotheby’s International Realty represented the unnamed buyer. In May, HSBC Bank USA filed for foreclosure alleging the owners of the property had defaulted on a 2010 mortgage that had an original principal of $16 million. Kogen previously told Pacific Business News that the sellers were working with the bank. The property consists of three parcels between Kalaka Place and Kamani Kai Place with the addresses 206, 208 and 210 N. Kalaheo Ave., that were sold as one property with three homes — an eight-bedroom, eight-bath main house, a five bedroom, five-bath “villa,” and a three-bedroom, three-bath guest house. The property had been featured in The Wall Street Journal’s “Home of the Day” in 2014, when the combined property was listed for $24.95 million and the beachfront house alone was available separately for $18.5 million. Sotheby’s International Realty Affiliates LLC today announced that Curate by Sotheby’s International Realty(SM), the first real estate-branded augmented reality (AR) app, is now available on Apple iOS-enabled devices, iPhone and iPad. Curate by Sotheby’s International Realty allows consumers to visualize a home as their own before purchase by taking virtually staged images from a flat, 2-D screen into the house itself through the power of AR. The app, originally built with ARCore, Google’s AR Software platform, was launched in the Google Play Store earlier this year. In addition to expanding to iOS, the Sotheby’s International Realty® brand has also partnered with luxury furniture and accessories marketplace Viyet to launch shoppable AR scenes within the app. The partnership with Viyet, a subsidiary of the Sotheby’s auction house, will be ongoing with new, custom-created scenes added regularly to reflect the marketplace’s current inventory. Curate by Sotheby’s International Realty is powered by roOomy. To learn more about the app, click here. Enter through the discreet and unassuming entrance and escape to an oasis of relaxed refinement and classic island ambiance. Enjoy your life gazing through your windows to the sea with a view of the Mokuluas that you could easily mistake for a dream. This home evokes a bygone era, yet offers all the modern conveniences of a thoughtfully renovated home. Paddle out with kayakers, outriggers, and turtles. An exquisite tropical garden within the large fully fenced property offers shade, flowers, and a great play area for kids and pets. This is one you truly don’t want to miss. We are pleased to be a part of GATEWAY Magazine’s Spring Design issue. Kaupoa Bay on Molokai Ranch is truly an oasis. To find out more about this property and other Carvill SIR listings please contact us! Last month the first ever permitted 3D printed home in America was unveiled at South by Southwest (SXSW) in Austin, Texas. The project was the inception of the Sotheby’s International Realty® brand’s charitable partner New Story and their construction technology partner, ICON. Significantly decrease the cost of building a home in the developing world. Currently, it costs $6,500 for New Story to build a home. The printer will significantly cut the cost to $4,000 a home with potential for it to continue to become more affordable. Make home construction faster. Homes can be built in 12-24 hours with the printer. Improve the quality of the final home. A defining factor of this new technology is that it will be used first in the developing world, in El Salvador, for people who are currently living without shelter, a basic human need. The printer can fit on a truck so it’s easily transportable, it’s durable and it uses a mortar that can be found anywhere. The 3D printer received significant media coverage including Architectural Digest, Fast Company, Wired, The Verge, PBS and BuzzFeed to name a few.